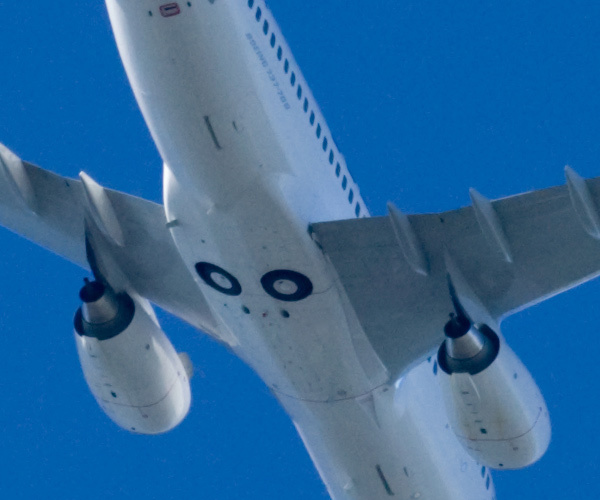 This Boeing 737-7CT belongs to WestJet and is shown gaining altitude over Barrhaven, just after takeoff from runway 07 of Ottawa’s MacDonald-Cartier International Airport. Doesn’t it look all shiny and new? 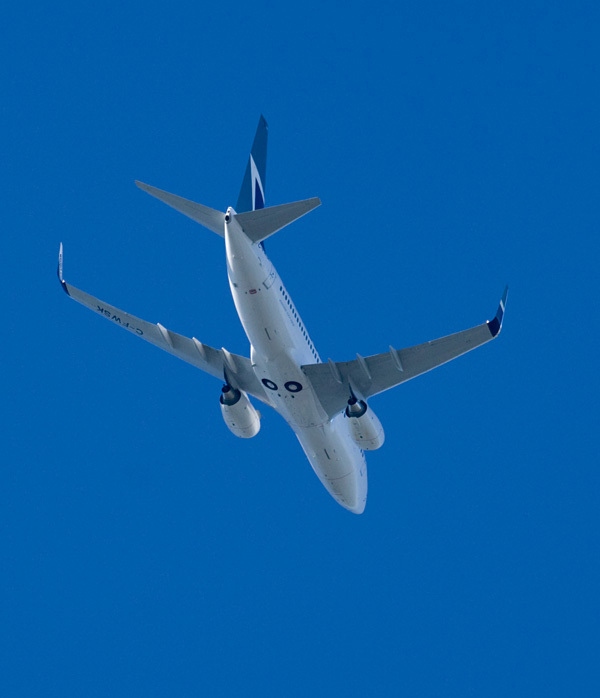 It ought to, WestJet took possession of this newest version of the 737-700 just a day short of a month ago. Permit me to rave about the lens used to take this photo. Canon’s EF 400mm f/5.6 lens is a peach. It doesn’t have image stabilization, and suffers from a slow f5.6 maximum aperture, but it makes up for these shortcomings by having outstanding image quality even at maximum aperture, and especially by setting you back less than $1300 if you shop carefully in Canada. Granted $1300 isn’t exactly pocket change to most of us, but consider that the EF 400mm f4.0 DO IS USM lens costs $6000 and the EF 400mm f2.8L IS USM lens costs $7500. A mere $1300 for comparable image quality is starting to look pretty good, isn’t it? Yea, of course it is! It’s just the f5.6, especially with no IS, that could be a problem. With those prices, I’ll manage. Note the engine detail and the model number visible toward the rear. Ya gotta love that 400! Thanks Brett. I don’t always take the 400 with me, but it really does the trick when I do!